MAJOR DEVELOPMENTS on Constitutional Carry! The past week brought some exciting developments in our fight to pass Constitutional Carry law in Iowa! At the risk of giving it all away, Constitutional Carry has been assigned to a Senate Sub-Committee and will be heard this week Thursday at 12:00pm! More, insiders report to us that the bill is expected to sail out of the sub-committee, a testimony to your grassroots activism and a pro-gun Senate caucus. 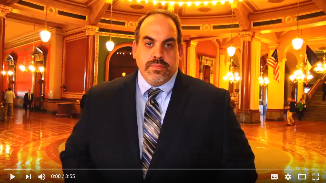 To learn more, and to hear who will be joining us in Des Moines testifying on behalf of this bill next Thursday, watch the video below! Folks, this bill is moving thanks to your calls and your emails and I can’t thank you enough. If you want to come to Des Moines and join us for this sub-committee, we would love to have you — and we’ll provide more details on this early next week. Finally, please note that as this bill now moves forward, the anti-gun forces in the Capitol — not to mention the FAKE NEWS and Bloomberg-funded groups –- will be on the warpath. The Iowa Gun Owners board of directors has already had initial conversations about our ability to mount a statewide radio and TV ad blitz as we approach a floor vote on this bill -– to counter the lies of our opponents. But we are going to need help, as we are still working to rebuild our reserves after an expensive but wildly successful 2016 election season. So if you can’t meet us in Des Moines next week, please consider an immediate and generous contribution of $100, $50 or any other amount to help us prepare for this floor fight! Thank you for your support thus far, we’re making great strides, but we have a long way to go. Get ready! P.S. This past week we have seen some amazing developments in our fight to pass Constitutional Carry. More, this bill will be heard before a Senate Sub-Committee NEXT THURSDAY! For all the details, please watch the video update we’ve prepared for you! If you can join us next Thursday, we’d love to have you stand with us. More details to come. In the meantime, please help us prepare for an all-out war with anti-gun legislators and Bloomberg-funded organizations who will be doing everything they can to try to stop us. ISSDA and National Gun Control Groups Trying to Stop Constitutional Carry!